The Canadian Prairie – a farm in Saskatchewan Province. 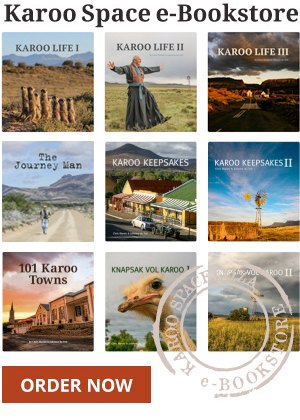 One of the absolute pleasures of running our new Karoo Space e-Bookstore is talking to South Africans and other Karoo lovers from all over the world. A new Karoo Space friend is Sophie Geerts from Saskatchewan, Canada. Firstly, I am not South African but rather first generation Dutch Canadian. Truthfully I hate Canadian winters with a passion. I’m not into hockey or poutine. I was just in the Karoo this year for three months with my two children. Downtown Fraserburg, where Sophie and her children stayed for two days. Part of the adventure took us to Loxton where we found and purchased signed copies of your Karoo Keepsakes (both editions) in the Rooi Granaat shop. We also found a signed copy of one of Deon Meyer’s works as well. To make a long story short, in the Rooi Granaat, as I was flipping through Karoo Keepsakes I, I came across the picture of the two Goths from Fraserburg. During our trip, we had stayed in Fraserburg for a couple of days and I had seen these people walking the streets of Fraserburg. I thought they seemed like such an anomaly in a conservative Karoo dorp such as Fraserburg, and took notice of them immediately. Now here I was in Loxton reading a piece devoted to them. I found it very interesting that they were such talented artists. On our way back to Fraserberg from Loxton the road was incredibly rough. We had a tiny little rental car that had no clearance. Not the greatest idea in the world. Sure enough I hit something very solid and damaged one of my rims. We made it back to our guesthouse where I asked the owner, Julianna, if she knew anyone that could change my tyre. Daniel Johnson-Barker and Debbie Morkel, the artistic and kind “Goths” of Fraserburg. So who did she call? None other than Daniel the Goth! He changed my tyre and arranged for the other one to be fixed. Everyone there was so helpful and I’m so grateful. While we were waiting for the tyre I was able to meet his partner Debbi Morkel, who showed me her beautiful artwork and interesting home. It was all so surreal. A few hours prior I was in Loxton at the Rooi Granaat reading about the ‘Gothic Karoo’. Maybe Deon Meyer would suddenly appear out of a Karoo bossie? I am originally from Winnipeg but have been living in south-central Saskatchewan off and on for the past three years. It is also the grammadoelas out here. 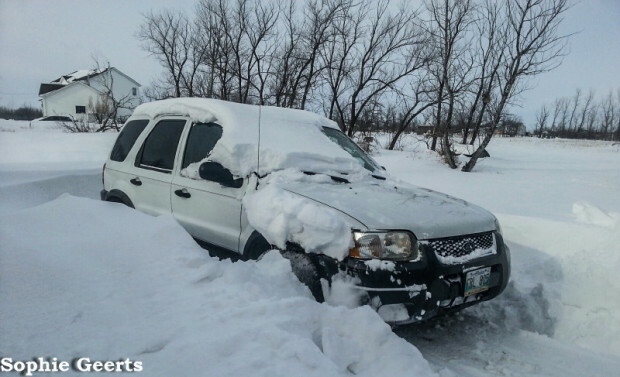 There are many parallels to the Karoo and this vast area of Saskatchewan. Some of the old farms (more than 100 years old) even have windpomps exactly like in the Karoo. The desolation is nearly the same. It is almost the same haunting feeling that places like this evoke, but it just isn’t the Karoo even though I try to deceive myself intentionally sometimes when I am driving. 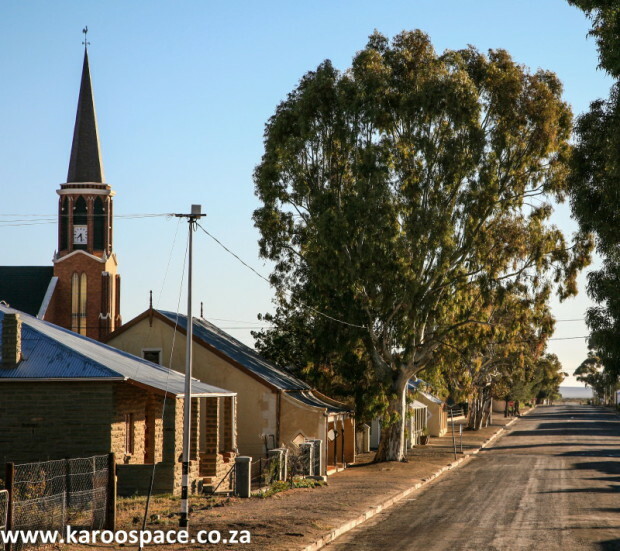 Wintertime in Saskatchewan – best spent in the Karoo! Instead of Karoo bossies we have patches of sage. Instead of dainty antelope like Springbok we have Pronghorn antelope and mule deer. Instead of dassies and meerkats we have prairie dogs. No Karoo kopjes but we have rolling hills. No Dutch Reformed Churches, but lots of Roman Catholic or Anglican ones. The small towns are dying out and real estate can be picked up at very reduced prices but the houses are not embellished with candy-striped tin roofs and Victorian broekie-lace. They are just square wooden houses with asphalt shingles (I live in one). We also don’t have the townships or informal settlements, although we do have First Nations Reserves but they are usually quite separate and far removed from the towns and cities. This area used to also be a swamp (another parallel) and they have found numerous fossils including full Plesiosaurous fossil remains. During our Karoo visit, I home-schooled my son, swam in the Gamka River and talked to ostriches in the Little Karoo. It was so much better than experiencing another Canadian winter – even if I found scorpions in the bathroom at times! 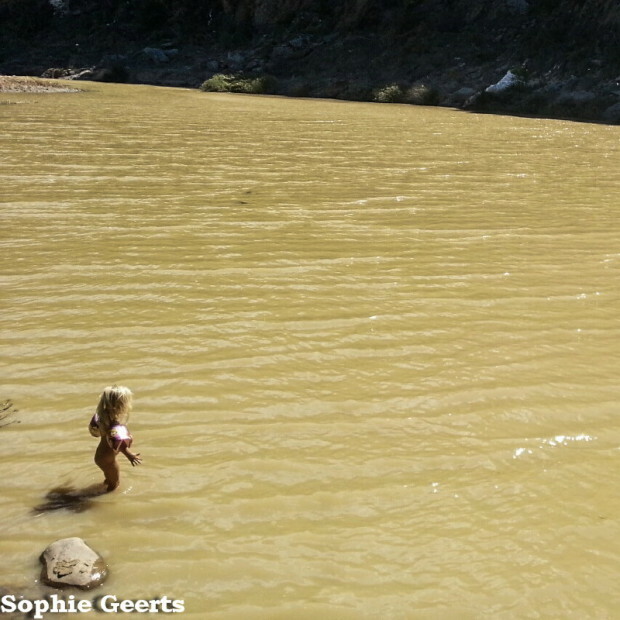 One of the Geerts children swimming in the Gamka River. Sophie, what a great response! As a special thank-you, we have arranged for a free weekend (bed and breakfast) for you and your children at Die Tuishuise in Cradock. You mention candy-striped tin roofs. Well, our marketing partner Die Tuishuise has more than two dozen of them, with a Victorian-era grand dame of a hotel at the end of the street. Lisa Antrobus-Ker of Die Tuishuise has confirmed that, when next you guys are in South Africa, one of those cottages is all yours for two nights. 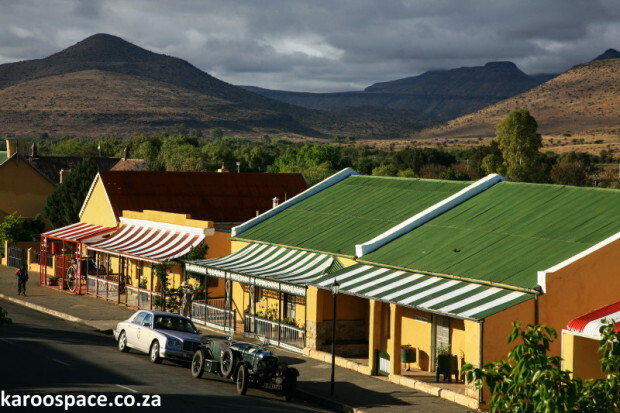 You will be staying in one of the heritage highlights of the Karoo. Be sure to check in with us before you arrive, so we can have a drink together. Your prize, Sophie – a weekend at Die Tuishuise in Cradock. Stunning! 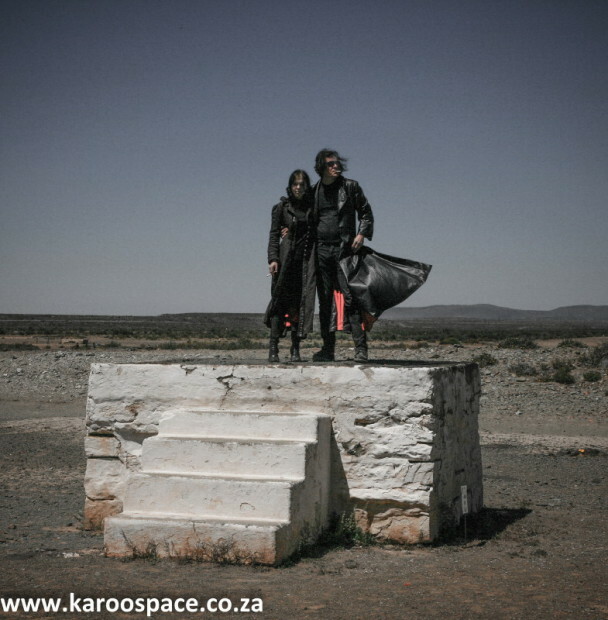 You two are the treasures of the Karoo!